Rory to Koppai, Rory to Koppai! Mayday! Mayday! Emergency distress transmission, Foxtrot 249. I am broadcasting from an unknown location, do you copy? We've got a situation over here! I've crash landed on a strange planet that's home to a bunch of dangerous predators, and a disturbing lack of unencrypted Wi-Fi. I've managed to befriend the more amiable denizens of this verdant homeworld, which I am tentatively titling PNF-404. These creatures are capable of incredible displays of intelligence. Most of my equipment was destroyed in the wreckage. Luckily, my KopPad - including its nifty camera - is still fully functional. I have documented the behaviour of these extraordinary creatures in the attached video log. Please take the footage to the lab for extensive analysis, Echo Callsign-Actual Bogie Foxtrot Tango. Oh, and subscribe to our YouTube channel. Over and out. So far all of your videos have been amazing, Rory! You can now add this to your collection. Awesome David Attenborough impression! He's my favorite documentary narrator. Bahaha! This is epic! Well done, Rory! 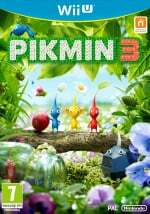 Best Pikmin 3 commercial I've seen thus far, Nintendo should run it on the Discovery Channel. Way better than that megalodon mockumentary that almost single-handedly destroyed shark week. Congrats Rory for a job well done. I really need this game. This convinced me to get this game more than any other ads or blogs about pikmin 3. Good job! This was very creative. Nicely done. Now that was An Amazing Video! This really would (and does) make a great advertisement for pikmin. This is fantastic. I 100% agree with those that say this would work brilliantly as an advert for the game. Well done! I wasn't sure what the video was actually going to be about, but that, was pretty awesome! I've always thought that since they are plants....don't they just thrive off of the sunlight some wind and some water? It seems like the obvious choice. I mean no offense to anyone, but this video is by far better than any game review I have ever read. I know it was meant as satire but it was entertaining, yet very informative of the game. I'll even go as far as saying it presents the game much better than even Nintendo has. Great job guys! Wow... Absolutely superb! The video actually seems as if it was taken right from a Discovery Channel nature program. I haven't had already the game i would buy it right now and i do also agree with BossBattles on that matter. Fair is fair, rory deserves the ad time for Pikmin 3! The ads here on the west coast of the states have been few (if any on television) and far between, Rory FTW!